Jonathan, the new CraftSanity multimedia editor, and I are back with another video tutorial complete with a blooper reel. Ha! This video covers the whole process of weaving with fabric on the CraftSanity Looms from tearing the fabric into strips and connecting them into one continuous strand (without tying knots!) to the weaving and finishing process. We even show you what to do when things don’t go perfectly and how to laugh it off when the stitching on the deck swing you’re sitting on starts to give way. What does this have to with weaving? Tune in to find out. 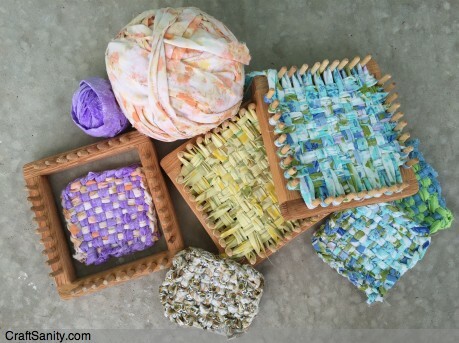 : ) This video tutorial features the 9-peg CraftSanity weaving loom, but this technique can be used all the CraftSanity looms. You can shop the full CraftSanity loom and magazine collection here. We hope you enjoy the video and welcome you to post feedback and ideas for upcoming tutorials below. If you missed our first two video weaving tutorials, you can find them here. And you can subscribe to the CraftSanity YouTube channel here. coaster weavingcoasterscraftsanity loomsCraftSanity video tutorialfabric weavinghow to weave on a CraftSanity loomRecycled Crafttutorialupcycledvideovideo tutorialweavingweaving with a continuous strip of fabricweaving with fabricweaving with torn fabricwood peg looms.